After eating super sweet Hawaiian style hot dogs at Puka Dog (next to Poipu Tropical Burgers at the Poipu Shopping Village), we thought why not wash them down with more sweetness? 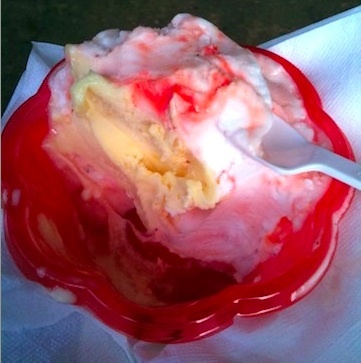 We popped into Papalani Gelato to taste their creamy offerings. 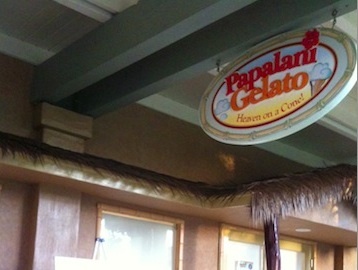 Papalani Gelato offers Kauai Made, gourmet gelato, Italian ice cream, sorbetto, sorbet, as well as cakes and pies in a variety of flavors. We enjoyed their local Kauai flavors like kulolo and macadamia nut. They don’t stop with just ice-cold items; they even have own line of hand made fair trade chocolates. 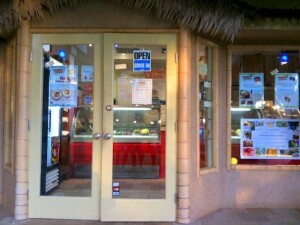 For those with special dietary needs, you’ll be happy to know that shop is gluten-free friendly and vegan friendly! Papalani Gelato is mindful of their business footprint. They use 100% biodegradable gelato cups and containers made from corn, buy local products, organic, and fair trade ingredients. We appreciate their commitment to sustainability, and always enjoy supporting local companies whenever we travel.